Cannot leave the house without a lip balm? 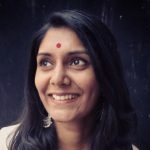 Then, this article is just perfect for you! That’s because it is time to upgrade to a lip balm with SPF. Why? Let me explain. You protect your face with sunscreen from the harmful rays of the sun – shouldn’t you do the same for your lips? Yes, of course! And, lip balms with SPF are perfect for shielding the lips from sun damage. 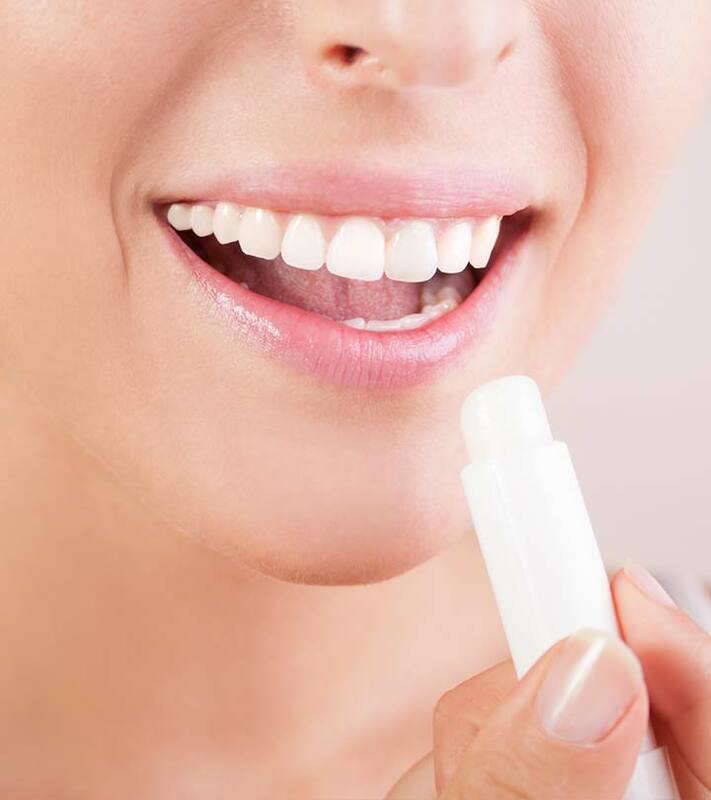 Therefore, we decided to help you and make a list of the best 10 lip balms with SPF available in the market. Take a look; they are listed down below. 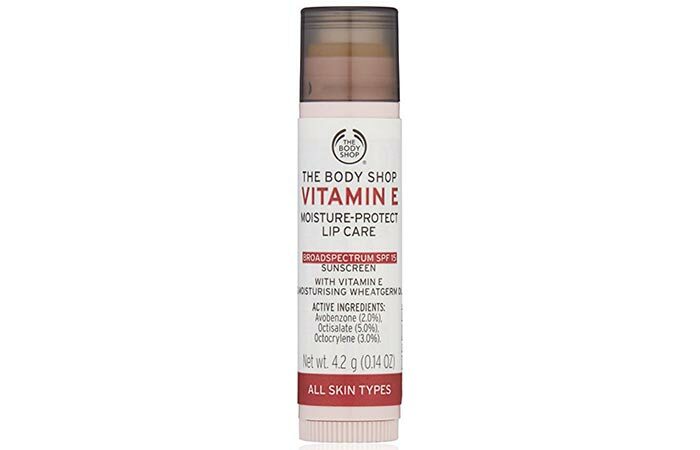 The Body Shop Vitamin E Lip Care SPF 15 protects the lips from the damage caused by the sun. It is moisturizing and soothing. The lip balm contains vitamin E, which neutralizes free radicals to make the lips healthy and luscious. 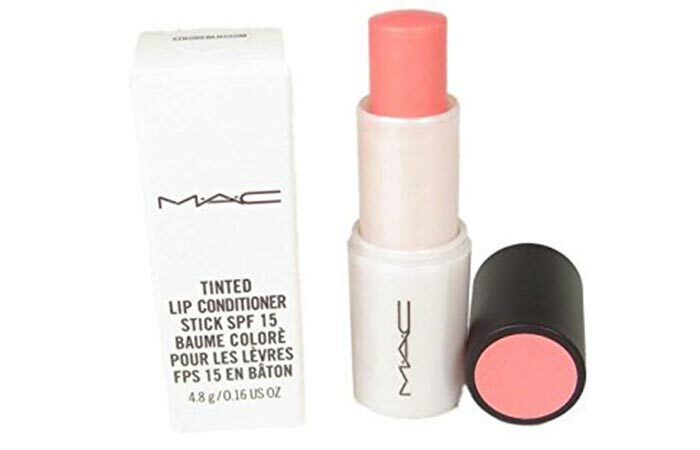 MAC Tinted Lip Conditioner SPF 15 conditions and moisturizes the lips. It adds a natural shine to the lips. The lip balm with SPF conditioner contains almond oil, shea butter, and avocado extract, which nourish the lips intensely. 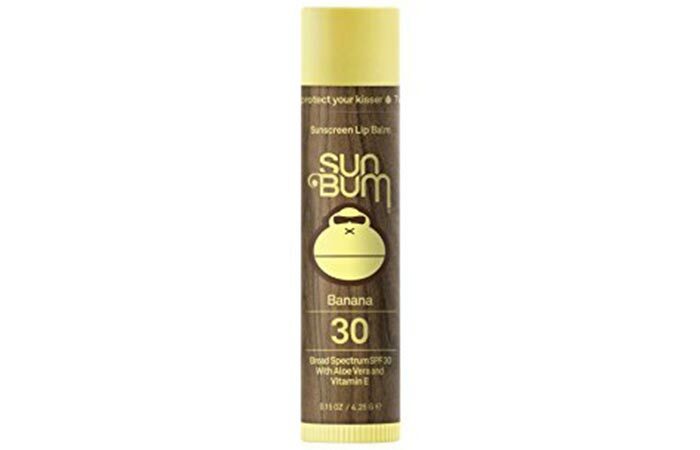 Sun Bum Sunscreen Lip Balm SPF 30 repairs chapped lips and protects them from the drying effects of the sun and wind. The lip balm with SPF contains cocoa butter, aloe extract, and Vitamin E that soften and renew the skin on the lips. 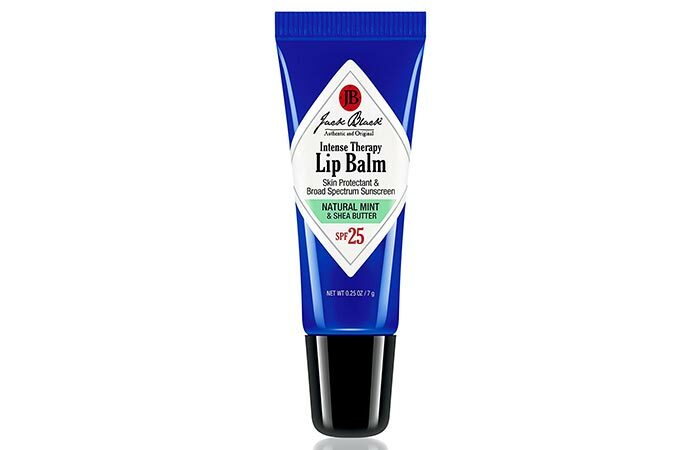 Jack Black Intense Therapy Lip Balm SPF 25 relieves irritated and chapped lips. It heals cracked lips and protects them. The lip balm with SPF contains grapefruit, ginger, and shea butter, which refresh and condition the lips. 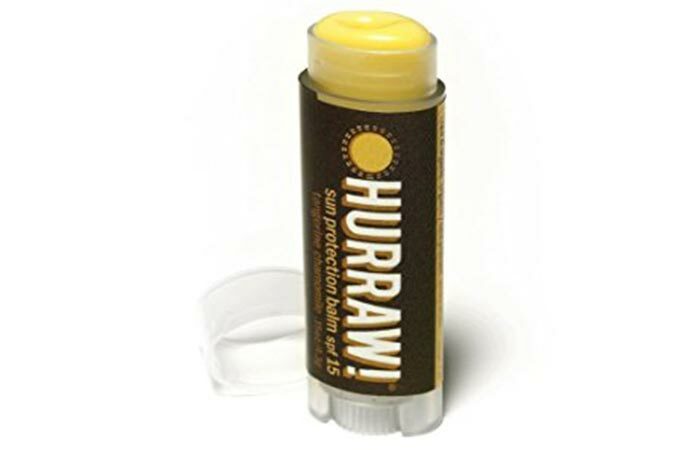 Hurraw Sun Balm SPF 15 is calming on the lips. It moisturizes, protects, and heals lips damaged by the sun. The lip balm contains raspberry and pomegranate seed oils that are anti-inflammatory and deeply penetrating. 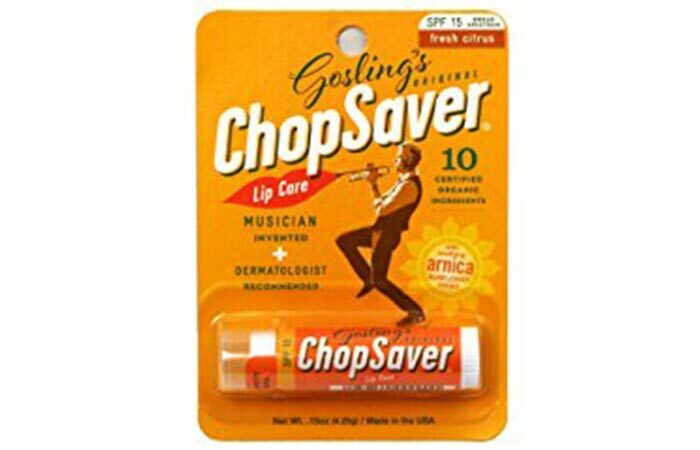 Gosling’s Original Chop-Saver Lip Balm SPF 15 works well for chronically chapped lips. It treats dry and swollen lips effectively. The lip balm with SPF contains fresh citrus and arnica sunflower extract, which give complete and comprehensive care to the lips. Eco Lips Zinc Sunscreen SPF 15 smoothens the lips and makes them healthy looking. It prevents sun damage and reduces the risk of skin cancer. The lip balm contains tamanu oil and raspberry seed oil that nourish the lips. It has a non-nano zinc oxide mechanism, which safely protects the lips. 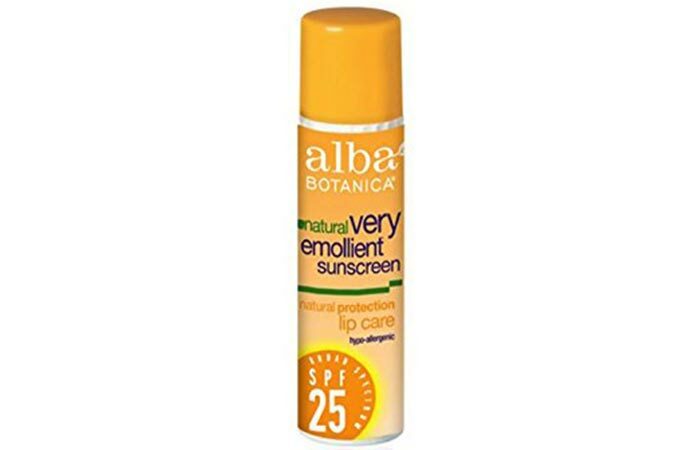 Alba Botanica Broad Spectrum Lip Balm SPF 25 protects the lips from the sun and makes them soft and dewy. This lip balm contains cocoa butter, sunflower oil, and aloe vera extract that provide 24-hour protection from pollutants. 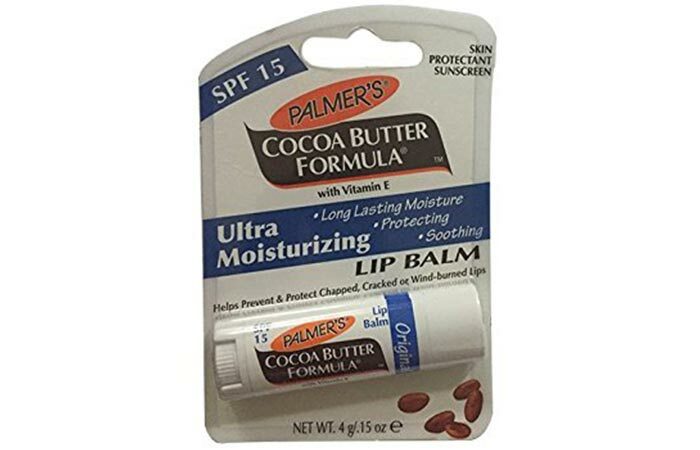 Palmer’s Cocoa Butter Lip Balm SPF 15 intensely moisturizes the lips. It effectively treats cracked and wind-burned lips. The lip balm with SPF contains Vitamin E that nourishes the lips and improves the texture of the skin. True Natural Lip Balm SPF 30 provides long-standing sun protection to the lips, making it ideal to use during outdoor activities. The lip balm with SPF is mineral based and contains natural ingredients. It is alcohol-free and forms a protective layer on the lips. Along with moisturizing your lips, your lip balm should protect them from the sun too. The simplest way to get both is to choose a lip balm with SPF. They work the same as lip balms and have the added advantage of having SPF. So, check the list of top lip balms with SPF above and get one right now! 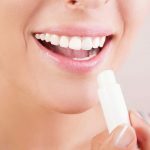 How often should I use a lip balm with SPF? Use it every day. Apply the lip balm at regular intervals through the day. Is a lip balm with SPF better than a lip balm without it? Choose the one that works well for you. For example, if you have to spend the day outdoors, then it is best to use a lip balm with SPF.